Each rain barrel already includes a T-shaped overflow outlet which fits snugly into a 1+7/8 inch (just under 2 inch) overflow opening at the top side of most rain barrels. A single outlet handles overflow and provides the option of connecting additional rain barrels in series. 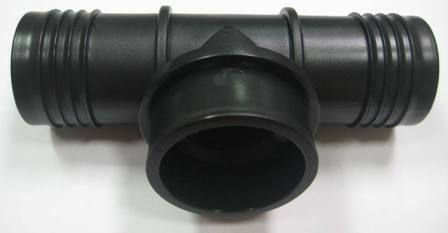 The black T-shaped outlet accepts 1.5 inch overflow hose on one end and is closed on the second end. The closed end can be easily cut open if a second rain barrel is to be connected in series.